My due date was quickly approaching. Dave and I were getting ready to move into our first house that we would now own on September 1, 1992. At night we were sleeping on the sofa cushions at Dave’s parents home because I was huge and our one bedroom apartment did not have air conditioning. 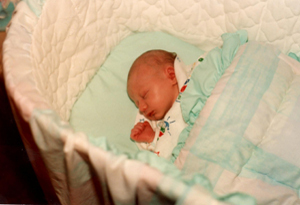 In the early morning hours of August 28, 1992, 5:34 to be exact, I began to experience a brand new feeling. One that hurt yet made me look forward to more of it. One that made me curious. A pain that I wanted to feel again and the anticipation of it was killing me. “I think this was a contraction”! My pregnancy bible “What to Expect When You’re Expecting” had described this feeling but because it was so new and short and unbelievable I just couldn’t be sure. “Come on, do it again”! I was thinking to myself. I lay quietly beside my husband not wanting to wake him until I could be sure that this was a contraction. I waited still and silent with excitement for the sensation to happen again. “Oh my God there it is again, wait just try to feel it, pay attention to how it feels, is it the same as the book describes”? It was gone again. I quietly anticipated the next one. “Please let there be a next one”. I watched the clock, it seemed like time had stopped, my excitement could barely be contained and I desperately wanted to wake the house but I had to be sure. It happened again, this was not false labour I was sure and I was so happy that I was going to become someone’s mommy today. I began to cry silently tears of joy. I could feel them slip from the outer corners of my eyes as I lay on my back, a constant stream of joyful tears slipping off my cheeks and onto a nest of sofa cushions on my mother and father- in- law’s living room floor. It is now about 10 minutes before Dave has to wake up to go to work and I can’t contain my excitement another second, I am sure this is true labour. I wake Dave by touching him on the shoulder and whispering in his ear, “Wake up honey, I think that I am in labour”. His groggy reply “You think so”? So I told him about my morning so far and suggested that he stay home from work. What happened next did not surprise me because Dave is driven and always has been� “No I can’t call work they are expecting me. Call me when you know for sure and then they will let me leave”. Dave, always so responsible and hard working. It was a quality that David would later in his life come to love and respect about his father. The next sentence did surprise me though. “I will leave you money before I go; I need you to pay the arena for my ice time”. Really, did he hear that I am in labour? After Dave left for work I went upstairs to tell my in-laws. Judy told me to come lay down in the bed beside her. We talked between and during my contractions. She held me and cuddled me and made me feel safe. Dave’s dad, Terry listened silently to us and occasionally said a thing or two before he got out of bed to get ready for his day. About 45 minutes later Judy told me to stay in her bed as long as I liked and she set off to get ready for her day. I soon followed and we called Dave at work to update him on how quickly the contractions were coming, that this was real labour and that he should let his boss know that he might just be leaving early today. Once I got myself all ready Judy and I left to pay for Dave’s ice time at the arena. I went in alone and had to ask the office clerk to sit down in the office. The ladies wanted to know if I was sick. I told them no, I was in labour and now it is beginning to really hurt! They joked about me being too dedicated to my husband, running errands for him while I was in labour. I laughed, but if they only knew just how dedicated HE was they would understand why I was there. They assured me I was so strong and that would make me a great mom. None of us had any idea of just how strong this child was going to need to be and how he was going to give that strength to us. I went back to Judy and Terry’s and we sat with Dave’s sister Tracy. She talked softly to me and she massaged my back and shoulders. When I stood up to use the washroom I felt a pop high in my abdomen and it felt as if I was peeing but couldn’t control it. My water had broken and it was time to go to the hospital. Tracy got the garbage bags for the seat of her car, Judy dialed Dave at work, I retrieved my bag and off we went to meet Dave at the hospital. Upon our arrival I was asked to change into a gown and Dave had to help me because the pain was pretty bad by this time. It was then that I noticed not only had my water broken but that is also contained meconium which meant the baby was in distress. Dave got a nurse, she told me everything would be fine, they helped me into the bed and a fetal monitor was placed on my stomach. She checked me and informed us I was about 7 cm dilated. She looked over the paper coming out of the monitor beside the bed and made sure I was comfortable, then she left. I was afraid and in pain and doubted for the first time my ability to do this. I wasn’t sure what I wanted, to have Dave touch me or not, to be on my side or my back, to bring my legs up a little or have them straight. I wanted Dave with me but I didn’t want him to speak. At one point the pain was so bad I thought that I was going to die and suddenly I relaxed and felt peace and I can not even be sure I was conscious because it felt so peaceful. I thought to myself if I am dead this isn’t half bad, I’m actually okay with it. Then just like that I snapped out of it because my baby might not be as cool with it as I was and there was the pain again, now even worse than ever. I told Dave to get a nurse because I needed to push. He came back without her and tried to help me breathe while we waited for her. She came in, told me I didn’t need to push, I wasn’t dilated enough and I was just feeling normal pressure. I shouted at her I am going to push so you had better check me now! Dave said to her she should do it because he believed I would just push anyway. She reluctantly checked and to her surprise I was fully dilated and within minutes I was rushed to a delivery suite and encouraged to push. I didn’t want my baby to be born in such a cold environment, bright light, blue tiled walls, and surgical things everywhere. I realized the choice was not mine to make this baby wanted out now. I pushed. It was exhausting and painful. I was encouraged to push again. More pain, and almost completely exhausted! I followed their instructions exactly as they gave them to me and once the head and one shoulder came out the relief was rewarding. David cried right away and that offered even more relief. What was said next shocked me. The nurse said “oh he’s just a little peanut” and the doctor said “congratulations it’s a boy”. What? I had convinced myself that our baby was a girl! For a split second I was actually disappointed and disgusted with myself for being selfish. Then David was placed upon my chest… disappointment gone… replaced with complete admiration and unconditional love. Who knew anyone could fall in love in an instant. I loved Dave but this was something different, this was pure and magical and like something from out of this world in which words don’t and can’t describe. And just like that he was swept away for a moment, given to Dave to hold and taken away. 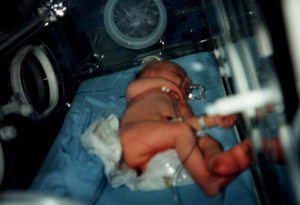 It was explained that he had a low APGAR score and would be in the neo natal for observation and rest. We would be able to see him in the nursery a little later. A while later we were brought to see him but it was not as I had expected. We had to look at him through the window and he would have to stay in the nursery overnight. He was so tiny and so beautiful. The nurse explained he would be allowed to stay in my room in the morning. She told me we both needed to get some rest. The next morning he was not brought to me. I asked for him, he didn’t come. I finally went to the nursery and knocked at the door and requested my baby be with me NOW. He was then allowed to come to my room, our room. We lay in the bed together and I spoke to him. I experimented with boys names and I finally broke down and whispered “David” it was the only name that fit. It belonged to him now. He was named after his daddy. David occasionally cried softly and each time I tried to feed him he would fall asleep. A nurse came in to help me. She went to ask for a specialist from the La Leche organization. It was this lady who realized that something was wrong. He was too weak to eat and his breathing was labored. David was taken from me once again and I was told we would have to remain in the hospital until he was stronger and they could determine what the trouble was. I called Dave crying and told him to come to the hospital now just in case David didn’t make it. We were terrified.